Name Engraving There is 1 product. 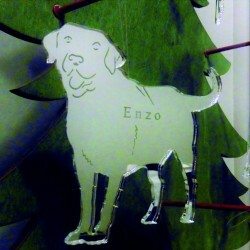 Have your pet's name engraved on the Christmas decorations. Have your pets name engraved on the Christmas decoration. The price of £0.10p is per letter. Please choose the number of letters required and advise the name/s required on which pet when ordering. We will as standard engrave the name with the first letter capitalised unless otherwise advised. Engraving is only available on mirror decorations.